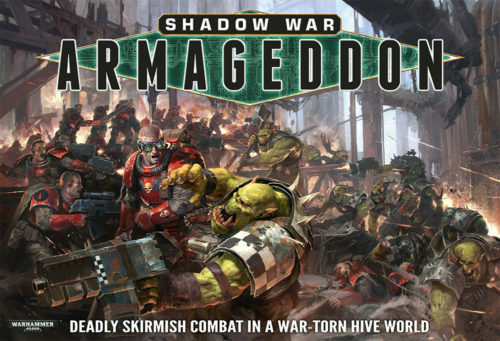 Necromunda is being announced at the Gamma Trade Show today, and its new name is Shadow War Armageddon. Orks and Space Marines will be in the box along with lots of terrain and rules. Right now we don’t have a huge amount of detail on this set (though we will, very soon), but what we do know is that it is a squad-level game set in the Warhammer 40,000 universe. The specific setting is the hive cities of War Zone: Armageddon, and the two forces pitted against each other are Space Marines Scouts from the Blood Angels Chapter and ferocious Ork Boyz. We think the idea of close-range combat amongst the sprawling ruins of Imperial industry sounds pretty ace. Right after Portal Games not that far in. Plus it shows off a new starter set for the Age of Sigmar, Thunder and Blood. It shows looks to come with quite a few miniatures that are push fit colored. plastic.. This will be out this Summer.